The earthquake that hit Sikkim on September 18, killing some 150 people and devastating the Himalayan state, was unexpected. The severity of tremor, or peak ground acceleration, was too high for a region categorised as Zone IV in the seismic map of India. Scientists say the map prepared by the Bureau of Indian Standards (BIS) is outdated. They have long been demanding that the map be upgraded to make it more reliable. The current map is nothing but historical data of earthquakes, says Vineet Gahalaut, seismologist at National Geophysical Research Institute, Hyderabad. Based on the intensity of previous earthquakes, it broadly classifies the country into four seismic zones, from the least dangerous Zone II to the most dangerous Zone V. There is not much science in it, he says. Until 2002 the map classified Latur in Maharashtra as Zone I. It upgraded the region to Zone III that year on the basis of the earthquake that measured 6.2 on the Richter scale and killed 20,000 people. Gahalaut explains that in seismically active areas, like the Himalayan region, an earthquake can recur within a few decades to a hundred years. In stable regions like the peninsular India the recurrence interval can be up to a thousand years. So, there should be a map which can indicate the probability of an earthquake in a region in the next 50 to 100 years. Scientists are already working to prepare earthquake probability map. Institute of Seismological Research (ISR) has prepared a seismic hazard map. It offers better probability and fine-tunes some loopholes in the existing map, says B K Rastogi, director general of ISR. For example, the BIS map classifies the entire Kachchh district of Gujarat as Zone V, whereas the ISR map places southern Kutch in Zone IV. Then there are patches of the Himalayan region that fall under Zone IV, but their vulnerability qualifies them for Zone V, Rastogi adds. BIS is reviewing the map prepared by Rastogi. But repeated calls to the BIS authorities to enquire about the map’s status yielded no response. The National Disaster Management Authority and the Ministry of Earth Sciences (MoES) have also prepared earthquake probability maps. But just a probability map might not serve the purpose. S K Nath of IIT Kharagpur, who recently prepared a probability map for MoES, says, “We need microzonation mapping for the country to identify which areas in a city are more prone to destruction in the event of an earthquake.” It considers various factors that can amplify the intensity of ground shaking when an earthquake strikes, such as soil quality and the region’s topography. For example, areas in a city which have a thick pile of sediment above the bed rock are more vulnerable to destruction. Nath says his studies around Sikkim show the state is more susceptible to earthquake than what the current map shows. “The entire state needs to be clubbed under Zone V. We have also found that a large portion of Guwahati demonstrates seismicity above Zone V,” he adds. N K Agarwal, formerly with the Geological Survey of India, agrees. “Seismic zone map and seismic microzonation need to be inclusive.” After all, seismic maps are used for planning nuclear plants, dams, industries and domestic constructions. Gahalaut says it might not be feasible to do the expensive microzonation mapping of the entire country. 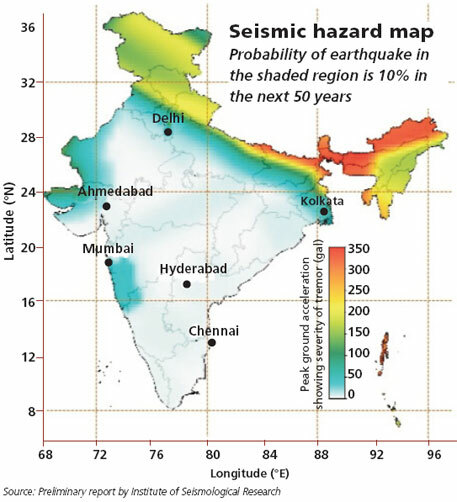 But the government should at least develop microzonation maps for populous cities like Delhi and Kanpur which are at high risk of being struck by a seismic hazard.